I know what you're thinking. That's not La Palette's Tart. 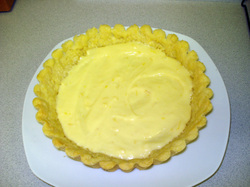 That's a regular tart! I'm not the biggest fan of strawberries. I'm not the biggest fan of tarts. I've never even HAD a tart in my whole life. But it's only my second week, and I want to support Dorie, A Year from Oak Cottage (this week's host-- seriously check out her page, what she made looks like it should be in Dorie's book!) and my fellow bakers and decided to forge ahead! I decided to use blueberries instead of strawberries. 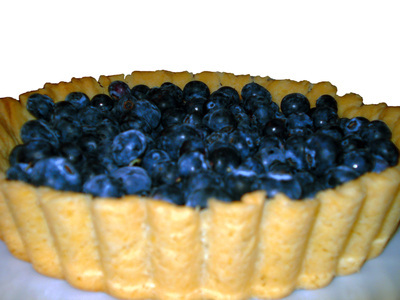 One of my favorite flavor combinations (besides mango and avocado, which may have been tasty in a tart, but I wasn't going to subject anyone to that experiment) is blueberry and lemon. 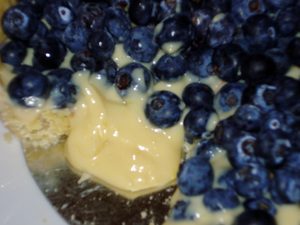 So instead of using a berry jam (which I actually wanted to do any make from scratch, but didn't have the time), I made a delicious lemon cream to enhance the flavor of the blueberries. 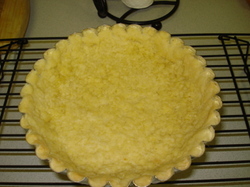 I also added some lemon zest into the crust for some ZING! 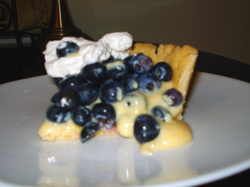 It was around the time when I started to pour the cream into the tart I said to myself "I think what differentiates the La Palette Tart from a REGULAR TART is the LACK of the cream and the ADDITION of JAM." Again, I forged ahead, standing by my decision (Tom Colicchio would be proud). 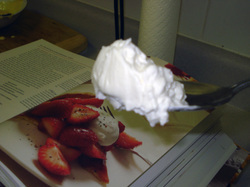 I did not have any creme fraiche`, nor did I have buttermilk to make my own, so I just made whipped cream by whipping some heavy cream and some confectioner's sugar to sweeten it up. 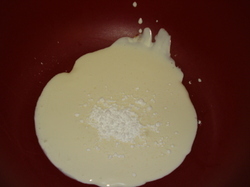 Combine all ingredients in a medium saucepan. Cook over medium low heat for 15 minutes, stirring frequently. Transfer to a bowl and cool completely before using. 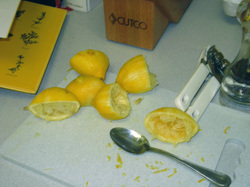 Death to a Lemon. On sale now at the MOMA store. For $80,000.00 USD. It was right about this point where I said to myself... this isn't La Palette's Tart. 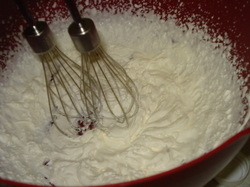 Fill with berries, top with whipped cream. You can also macerate the berries in sugar or alcohol. Alas, I did not have any alcohol. I rarely pass up an opportunity to...erm... enhance the flavor of food with liquor. Can turn to this in a matter of minutes. What it should have been. Sigh! Oh, well. Sweet food cures all ills. On a side note: I need a better camera for this. I am currently using a regular digital camera- a Sony Cybershot. But the pictures are too blurry! There are so many beautiful photographs on the Dorie Pages! Does anyone have any recommendations for a complete amateur who does not know how to take pictures and doesn't want to spend a ton of money on a camera? And of course, check out all Dorie participants and their delicious creations!